Who needs to get in some skiing miles this season? Who doesn't want to break the bank buying lift tickets? I know I'm guilty as charged. With the exception of last season when the snow was lackluster, I itch to get on the mountain as often as I can (take all this week). But there's one problem: Something else always gets in the way (again, take all this week). Work time, family time, exercise time, vacation-to-a-warm-island time. But where's the skiing time? Left on the backburner--or left for the three-day weekend holidays in January and February. Except with Martin Luther King, Jr. Day and President's Weekend already past, it's even tougher to get out on the slopes over the weekend when you only have two days to spare. The answer: skip work, plan a vacay and get skiing. And Liftopia has just the ticket, provided you can wait until March 4. Literally. Liftopia, which is the largest online marketplace for deals on lift tickets and mountain activities, recently launched one of its biggest sales of the season to coincide with the second annual National Play Hooky and Ski Week. The unofficial holiday runs March 4 through 8, the perfect time to escape work and other obligations to go skiing. And if memory serves me correct, the powder forecast isn't half bad either (2011, I'm talking to you). Schneidermann is right. There are fewer crowds midweek after all the locals have returned to their desks. There's fresh powder to be had and repeat runs to take through it--how many times have you seen powder dump pictures while you're sitting at your desk? I know I did two weeks ago when some storms rolled through. Save 84 percent at Suicide Six in Vermont with lift tickets starting at $7. Save 78 percent at Caberfae Peaks in Michigan with lift tickets starting at $7.50. Save 65 percent at Ragged Mountain in New Hampshire with lift tickets starting at $21.99. Save 51 percent at Loveland in Colorado with lift tickets starting at $29.99. Save 50 percent at Alta in Utah with two-day lift tickets starting at $72.50. 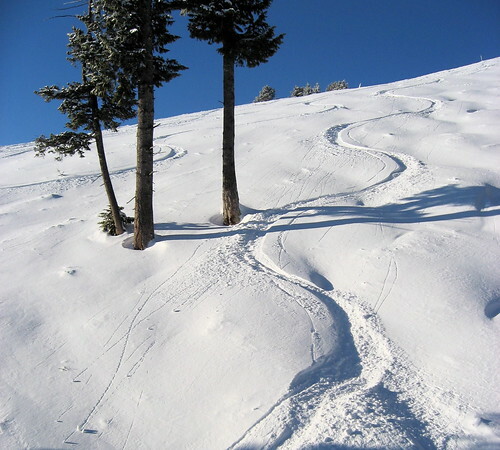 Save 44 percent at Diamond Peak in the Lake Tahoe area with lift tickets starting at $32.99. Save 32 percent at Homewood in the Lake Tahoe area with lift tickets starting at $45. Save 31 percent at Sunday River in Maine with lift tickets starting at $59.00. Save 30 percent at Sun Valley in Idaho with lift tickets starting at $67. Utah's Canyons, Colorado's Arapahoe Basin, and California's Squaw Valley and Alpine Meadows also offer deals during National Play Hooky and Ski Week. The only catch is you have to grab these deals on Liftopia before they're gone. But really, what are you waiting for? The ski season is half over and only getting better. Now my only problem will be breaking myself from my desk. How about you? Photo grabbed from jurvetson at flickr.